The 1982 Caesar’s Palace GP in 1982 was the first time I had a Photo Credential for a F1 race. Kent Smith, the curator at the Long Beach Museum of Art, had written a letter of support for me from the Museum because I was curating the “Passion and Precision” exhibition for the museum and I need firsthand access to Grand Prix participants and events for my research. I’ve written before about the disorientation I had walking pit lane, talking to F1 people and studying race cars I had only known from pictures in magazines and books. That “dream made real” concept seems ideal abstractly but the reality of experiencing it is another matter entirely. Photographing grounds me. Holding a camera means I’m working, thinking, making the decisions necessary to turn the world I see into a picture. It is both a conscious as well as intuitive process that I’ve practiced for decades until it has become second nature. When everything comes together a photograph emerges that is more than I expected and the best ones become personal milestones marking moments of my life. This is one of those significant photographs. 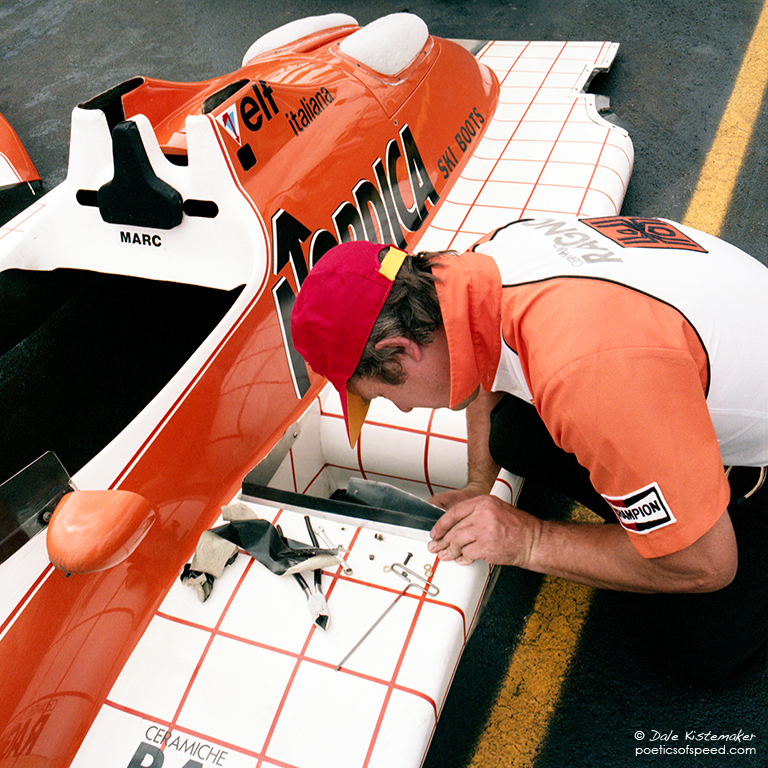 When I made a print of it over thirty years ago I realized it was the starting point of photographing Formula One the way I saw it, as a complex process where every detail mattered. When I made a print of it last week it was like a visit from an old friend.